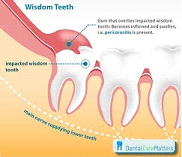 Pericoronitis is the inflammation of the gum that occurs at the crown of the tooth when a tooth is partially erupted, most commonly seen with wisdom teeth (third molars). Inflammation can be caused when bacteria, food and plaque accumulate underneath the gum opening and can be extremely difficult to clean out. In some cases, Pericoronitis can cause an infection which leads to swelling, pus and radiating pain to the head and jaw joints. Using a low-level laser, the inflamed soft tissue is removed from around the crown of the tooth making the area easier to clean and so reducing the chance of a recurring episode of Pericoronitis. This is a blood free procedure with faster healing and less pain than the usual surgical methods.